iPhone Says "Your SIM sent a text message"? Here's The Real Fix! You are at:Home»iPhone»Cellular»iPhone Says “Your SIM sent a text message”? Here’s The Real Fix! iPhone Says “Your SIM sent a text message”? Here’s The Real Fix! Your iPhone say “Your SIM sent a text message.” and you don’t know why. When this happens, there’s usually an issue between your iPhone and your wireless carrier. In this article, I’ll explain what to do when you receive this notification on your iPhone so you can fix the problem for good! Why Did My SIM Card Send A Text Message? Your SIM card sent a text message because it needs to be updated. Like E.T. the extraterrestrial, your SIM card is trying to phone home, except “home” is your wireless carrier’s update server. Unlike other updates and reset, your iPhone doesn’t restart after the carrier settings are updated. Sometimes, your SIM card might get stuck endlessly texting your wireless carrier, even after you’ve updated carrier settings on your iPhone. Turning your iPhone off and back on can give it a fresh start and may break the endless loop of texting by your SIM card. To turn your iPhone off, press and hold the Sleep / Wake button (the power button) until the slide to power off slider appears on your iPhone’s display. Swipe the red power icon from left to right to turn off your iPhone. Wait about 30 seconds, then press and hold the power again to turn your iPhone back on. Carrier settings updates are released by your wireless carrier to improve your iPhone’s ability to connect with your carrier’s cellular network. 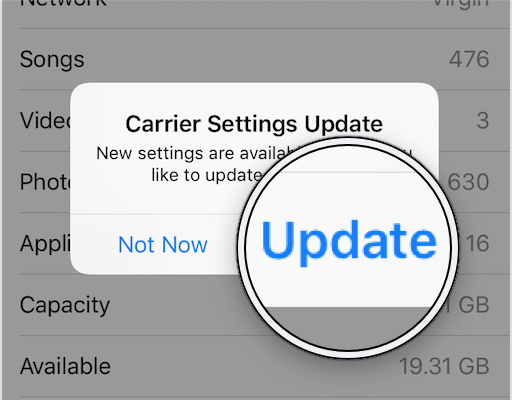 Apple also releases carrier settings updates, but they do so differently, so the SIM card doesn’t have to send a text message to update itself. To see if a carrier settings update is available, open the Settings app and tap General -> About. If an update is available, a pop-up will appear after about 15-30 seconds that says Carrier Settings Update. If you see this pop-up, tap Update. If the update alert doesn’t appear after about 30 seconds, then there probably isn’t one available. Ejecting, then reinserting your iPhone’s SIM card will give it a fresh start and allow it to reconnect to your wireless carrier’s network. iPhone SIM trays are located on the left side of your iPhone below the power button. To eject your SIM card, insert SIM card ejector tool or small paper clip into the small hole at the bottom of the SIM tray. Pull the tray out, then put it back in. 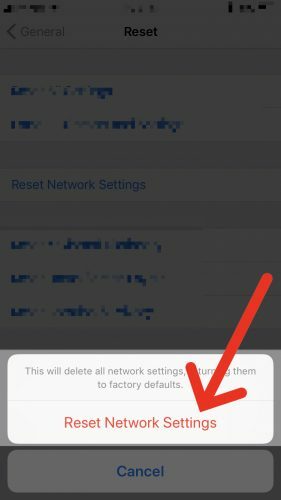 When you reset network settings on your iPhone, all of the saved Bluetooth, Wi-Fi, VPN, and cellular settings on your iPhone will be reset to factory settings. This has the potential to fix a glitch which could be causing your SIM to send texts on an endless loop to your wireless carrier. To reset network settings, open the Settings app and tap General -> Reset -> Reset Network Settings. Enter your passcode when prompted, then tap Reset Network Settings when the confirmation alert appears at the bottom of your iPhone’s display. 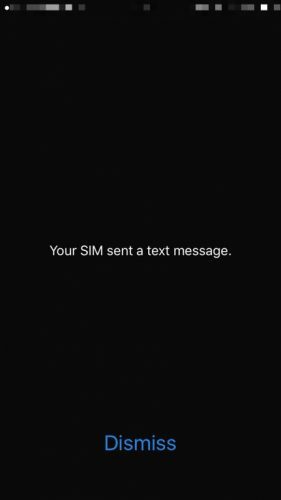 If you’re still receiving the “Your SIM sent a text message” notification on your iPhone, there may be an error that only your wireless carrier can address. Below are the support numbers of a few of the major wireless carriers. If you would like to see one added to our list, feel free to leave us a comment down below! 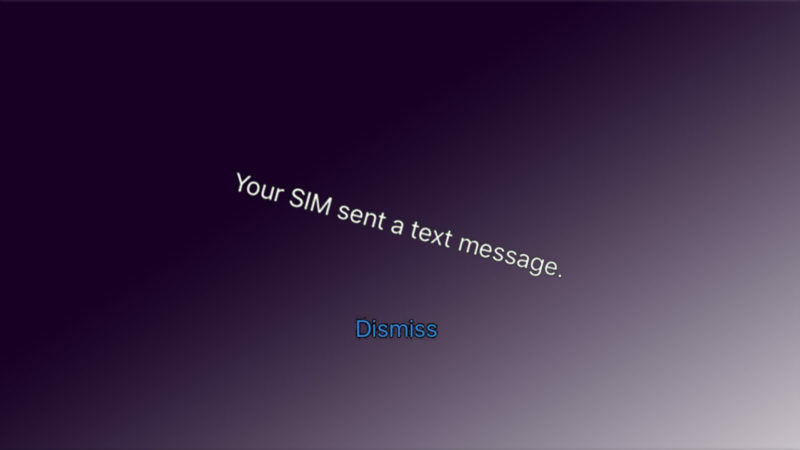 We hope this article helped you get rid of the “Your SIM sent a text message” alert for good! If you have any other questions about this issue, feel free to leave us a comment down below! David P. and David L.
Previous ArticleWhat Is Wallet On An iPhone And How Do I Use It? The Truth! Next Article Messenger Not Working On iPhone? Here’s The Fix!